The RTL Widnes Wild are delighted to welcome back Nick Manning for a second season in Wild colours. Scoring 14 goals and 30 assists in 23 league games and, averaging nearly 2 points per game, Nick was an important part of our success last season. “I am delighted to welcome Nick Manning back to the Widnes Wild. Nick was a player I defiantly wanted to re-sign for the upcoming season, he had a great first season in Widnes colours, I’m delighted Nick has agreed to return. Nick is a great player with the ability to score goals and create chances for his teammates”. Nick will continue to wear the #19 shirt for the Wild and you can own and loan his shirt here. 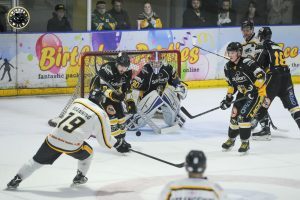 As previously announced Shaun Dippnall will the Wild’s captain once again this year and Simon Offord and Stuart Brittle will be alternate captains. Unfortunately, David Swanston will not be re-signing for the Wild this season. On behalf of all at the club we would like to thank David for his two seasons as a member of the Wild and wish him luck in the future.